We’d love your help. 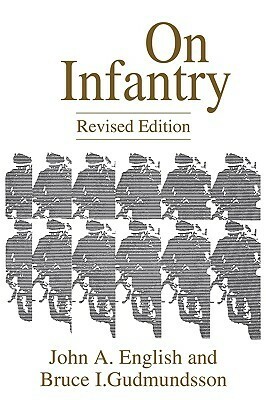 Let us know what’s wrong with this preview of On Infantry by John A. English. To ask other readers questions about On Infantry, please sign up. Very good military study book. Nice chapters with well laid out and written discussions. Recommended for military history buff. I've always been interested in how military doctrine is developed, so this seems to be the ticket for me, though it is a little dated, very cold-war oriented. Elglish starts with European infantry after the Franco Prussian war (really the last set piece battle war, if not already on the cusp). The book is best, in my estimation, in the discussion of the second world war. There's a hidden thesis that really starts here (it's not very strongly represented in the opening, thoughly strongly reflected I've always been interested in how military doctrine is developed, so this seems to be the ticket for me, though it is a little dated, very cold-war oriented. The book is best, in my estimation, in the discussion of the second world war. There's a hidden thesis that really starts here (it's not very strongly represented in the opening, thoughly strongly reflected upon at the conclusion), suggesting that, despite the relative weakness of th einfantry squad and the limited effect of its arms in the scheme of armoured maneuver, artillery and strategic air power, the skill and potency of the infantry at the smallest level was a major determinant ofnt he success of the various armies, and that the german army, in particular, was successful as long as it was (holding off both the Soviets and Western Allies) because of superior small unoit cohesion, traiing, agressiveness and leadership. As English was writing for a potential Nuclear battlefield in the Fulda Gap, I can see how this would be a bold statement. He does good work reflecting on the past in a consideration of Central Germany's prospects for the infantry fight in the 1980's. Warfare has changed greatly even in the last 50 years. The movement from the primarily attrition-driven tactics started in WWII and we arrived at what we could legitimately call maneuver warfare tactics by Korea. Bit old by now, with everything up to 1973. And the last chapter really made it more of a pamphlet rather than a scholarly tract. Nice details of sub-company developments though. Very informative, good history but definitely a dry read.